She looked at us all radiantly. "Do you always watch for the longest day of the year and then miss it? I always watch for the longest day in the year and then miss it." "We ought to plan something," yawned Miss Baker, sitting down at the table as if she were getting into bed. "All right," said Daisy. "What'll we plan?" She turned to me helplessly: "What do people plan?" With only a few days left in Malaga, we're getting into checklist mode, although this last week is especially stretched because I'm cramming two weeks' worth of Spanish lessons into one. Nonetheless, today was a good day for checking items off the list: visiting the Museo Picasso~Malaga; hanging out at the beach; trying some recommended paella. (1) The Museo Picasso may be one of the least-known Picasso-related sites in Malaga, at least among locals, because the building has no relationship to the artist. 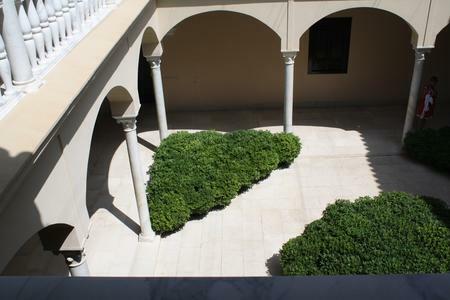 It's a lovely 16th century palace with marble columns and railings, built over some interesting archaeological ruins from both the Roman and Islamic eras, but its only connection to Picasso is that the museum opened there in 2003. 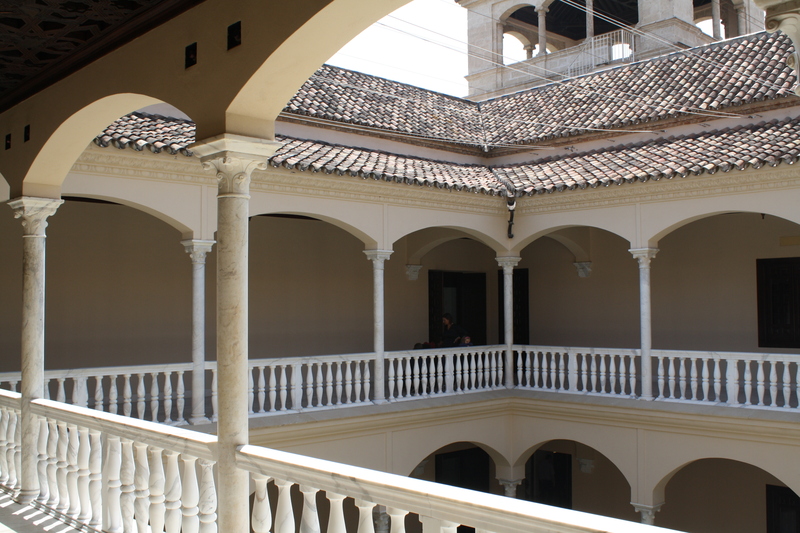 View of the second floor of the Buenavista Palace, which houses the Museo Picasso. In contrast, the rest of the city center is dotted with plaques proclaiming that here is where Picasso's father was born, there where Picasso was baptized, over thataway where Picasso pere did some artwork of his own... I specifically asked my taxi driver to take me to the Museo Picasso on Calle San Agustin, to which he agreed and then tried to drop me at the house where Picasso was born, on an entirely different street. After repeatedly insisting that this was the Musee Picasso, he finally condescended to type "Musee Picasso" into his GPS, and discovered that my destination really was not Casa Natal. (2) Malaga's city center is one of the best places I've found on this trip for strolling around on a sunny afternoon. Unfortunately, part of what makes it so nice for pedestrians is that cars aren't permitted in large sections of the area, and the taxi driver declared that the Museo Picasso was in one such area and that he couldn't get any closer. This was technically untrue, as there were roads closer to the museum. But since I lucked out finding the most direct walking route from where he dropped me, it almost certainly would have taken longer to coax him to take me to a nearer drop-off than it took to hurry to the museum by foot. Sol y sombra in the Buenavista Palace's courtyard. Continue reading What I Sort of Planned (Malaga, June 21, 2011). 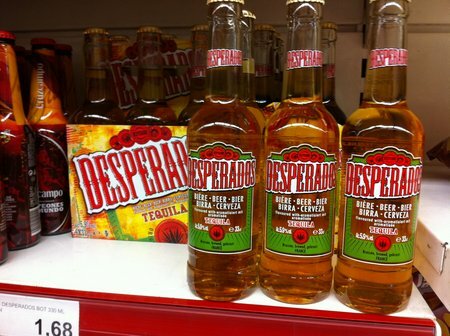 Tequila-Flavored Heineken: Has Anyone Tried This? Pallavi brought this to my attention while we were in the grocery store today, with the comment, "This looks like a very bad idea." So long as it's a choice between risking this and my new favorite, Alhambra 1925, I'm going to take the latter. Does anyone know if this is available outside of Spain, and if so, is it as horrible as it sounds? Back from the Millesime Weekend Valencia food festival. This weekend we drove thirteen hundred kilometers in order to consume an untold number of calories. 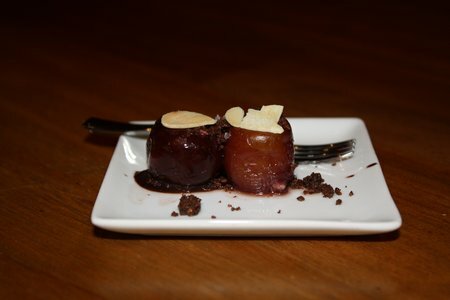 I suspect that Pallavi will be doing some food blogging shortly, once Picasa's upload function starts working again. And yes, I might have a wine review or three. The internet has long been the battleground for technology holy wars: UNIX v. Windows, Mac v. PC, etc. I have been surprised, however, by how many conversations I've seen recently concerning a new technology conflict: which is better, Kindle or iPad? (Wired even questioned, tongue very much in cheek, whether this reflects an ideological divide on the Supreme Court.) In particular, I was taken aback by the intensity shown by partisans on both sides when a friend wrote a query on Facebook asking if she should buy a Kindle. I'm not certain that the question makes much sense in the first place: these are two different technologies for very different purposes. But for use on a long-term trip like this one, I'd recommend the Kindle. There's absolutely no difference in the availability of books, since Amazon will quite happily sell their Kindle content to the iPad's app. Yet the Kindle has a number of distinct advantages for a long-term traveler. Price: Here, Apple is its own worst enemy. As of this writing, a wifi-only iPad costs $499. A Kindle with 3G and wifi costs $189, and a 32GB iPod touch $299. So the question isn't really "which device is better?" but "does the iPad do anything that a Kindle, plus another $300 device, doesn't do?" We've been traveling with an iPhone and Kindle, and I'd have to say that the answer is no. Continue reading How to Start a Holy War: Kindle v. iPad edition. Despite not being particularly religious, I picked up the basics of Christianity as I made my way through the public schools, along with a bit of knowledge about Judaism and Islam. Similarly, I learned about Shinto, Buddhism and Confusionism--the three major Japanese religious influences--as part of my undergraduate studies. But despite having been part of a Hindu wedding ceremony (in which I swore vows in a language I don't understand, and to this day have no idea what I swore to do), it wasn't until we went on this trip that I managed to learn much at all about Hinduism. Making our way through Asia opened my eyes to the prodigious influence of the Hindu religion on cultures outside India. By the time we set foot in Delhi, we had already visited Hindu religious sites in Indonesia, Cambodia, and Thailand. Thankfully, Pallavi had suggested that we go to the Ramayana Ballet in Yogyakarta, which gave me at least some grounding in one of the major works of the Hindu religion before we made our way further. 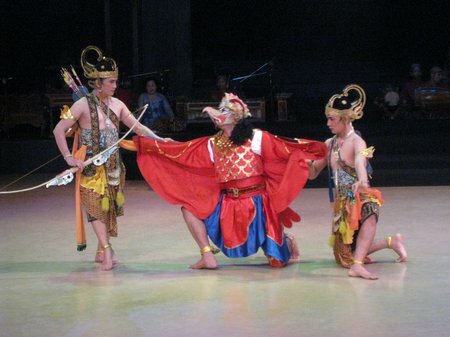 Continue reading The Ramayana Ballet (Yogyakarta, Indonesia, December 16, 2010). I recently received a request for a photograph of myself, and was left scratching my head. I actually do have an electronic album of my few decent photos, but that album is on a hard drive in storage somewhere in suburban New York. All I have with me are photos from this trip. Instead of weeding through several thousand photographs looking for a presentable image, I decided to cheat by relying on Picasa's facial recognition technology. I left the program running overnight and returned the next morning, coffee in hand, to the somewhat tedious task of identifying four thousand or so faces that Picasa had picked out of our photos. Most of these faces belonged to innocent bystanders, and could be set aside easily. There were a few photos of me, a few more of Pallavi, and several of friends and travel companions whom we've met along the road. In the end, I found a couple of pictures that didn't make me look like a deranged lunatic with a bad haircut. But Picasa also picked out the faces of two individuals who we'd photographed in several countries, and yet weren't friends or family. 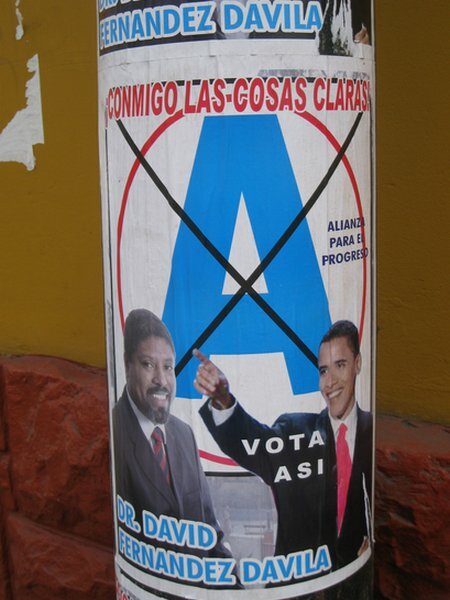 or on a campaign poster in Peru. 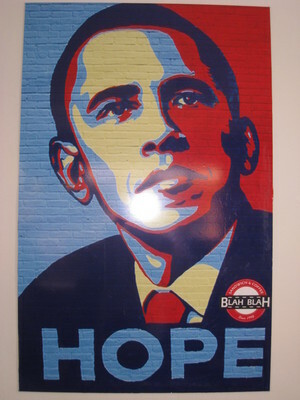 But while the President may get a bit of exposure, he's a virtual nonentity in comparison to the man who has followed our footsteps on every continent, in virtually every country: Che Guevara. Continue reading Faces that haunt our journey. As we were searching for places to go next, we came across two more blogs written by couples making lengthy journeys, both of which are quite good. The first, Yann and Catherine's Global Undertaking, hasn't been updated in quite a while, but I love how they insist that they are not backpackers. Their travel style mirrors ours pretty well. Jack and Jill's blog, on the other hand, has frequent updates and makes for a pretty pleasant read on a chill afternoon. They're in Ecuador now, and I'm hoping that they enjoy it as much as we did. We spent the weeks since leaving Marrakech making our way through Morocco by train: Fez, then Meknes, then Rabat, then Casablanca. Much of what we'd heard of Casablanca from other travelers wasn't very positive, along the lines of "spend a day, at most." Yet I rather enjoyed Morocco's economic capital. Besides the quite magnificent modern cathedral that is the Hassan II Mosque (worthy of a post of its own), the city has a new world charm and character that made for a nice contrast after a month of tajines in various ancient medinas. I owe part of my satisfaction with the city to the Hotel Amoud, which although at the top end of our budget, provided surprisingly good value for Morocco: the bed was comfortable, the bathrooms clean, and the location smack in the middle of the art deco district of Casablanca. While the Amoud itself is nothing special, it's neighborhood makes for some entertaining photography. I'm cursing the fact that I did my phototourism on an overcast day, when the light wasn't anywhere near ideal. 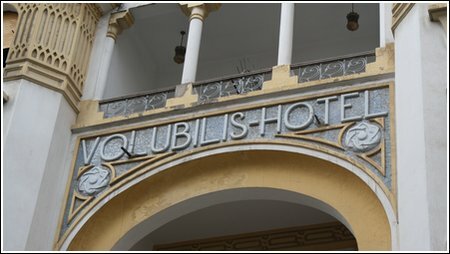 We've encountered a fair bit of art deco on our trip thus far, though we've not blogged about much of it: a few spots in Banos, Ecuador, or the small town of Ranfurly in New Zealand. Of these, Casablanca has definitely been the most fun. We didn't hit any of the bars or clubs after hours, but this is a well-known (if not exactly salubrious) nightlife area, not much frequented by tourists. Make sure to catch a cab home if you're going out. I would like to apologize for the problems that we seem to be having with comments at the moment. I've had a few reports that the site is timing out before accepting comments. This may be a problem with my web host, or it may be an issue with how MT rebuilds. The more I fight this system, the more that I wish I'd just installed Wordpress. Crowdsourcing question: Where do we go now? The situation in Egypt altered our travel plans considerably. We'd originally hoped to travel south from Egypt to Tanzania, from there to South Africa, and then on to Morocco. Instead, we skipped straight to Marrakech: South Africa is showing lows in the 50s and will only get colder, and we couldn't find an inexpensive London-Tanzania flight on short notice. Tanzania: Back to the original plan. Although tickets are expensive, the cost of living is pretty low, and we'd be able to make our way back to India without much fuss. Iceland: We'd been strongly considering Iceland as a recession-tourism destination. Despite their currency woes, however, it doesn't appear that the cost of living has fallen enough to make this budgetarily feasible. Greece: A few weeks on a Greek island might be a nice way to chill out, but they're still part of the euro, and unless the dollar surges this may be a problem. Ireland: Both of us have always wanted to go to Ireland. Same problem as Greece, however: the strong euro. Turkey: Midway between Spain and India, and would allow for weeks of "it's Istanbul, not Constantinople" jokes. Kurdistan: Adventure tourism. The NY Times says it's one of 41 places to visit this year, and the British Foreign and Commonwealth Office is apparently less anxious than the U.S. State Department. What could go wrong? As always, we'd welcome comments.